Maybe This Is Why UCLA Hoops Once Sucked? It's been two decades since they won an NCAA title. The glory years of John Wooden's titanic career are faded California dreams. But UCLA remains a nationally ranked team each and every season. This 1945 photograph, meanwhile, might help explain why Bruins hoops endured losing records for so many years before things turned around in the Wooden era. Did the team routinely practice while wearing boxing gloves? Was team spirit so abysmal that the most basic drills devolved into pugilistic chaos? Perhaps the school's entrance requirements at the time weren't terribly, ah, rigorous and these wiry lads are representative of the era's distracted, addled student body? 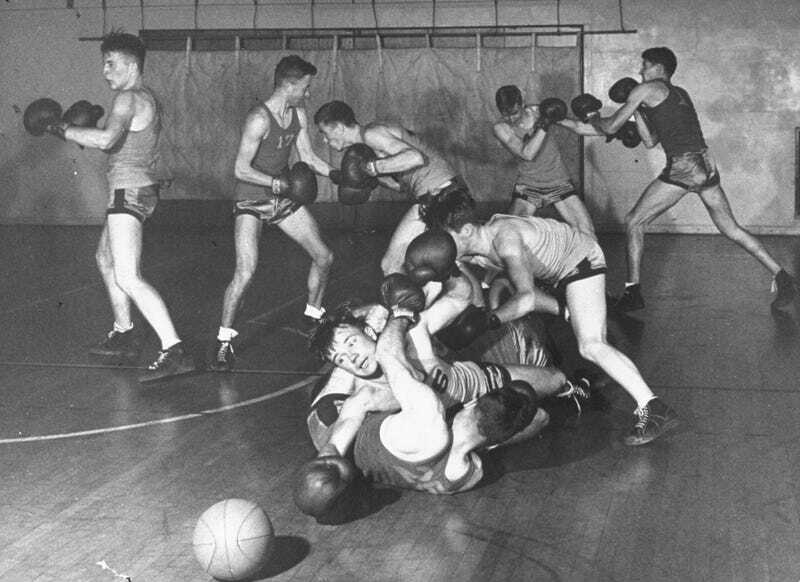 Determined to be officers and gentlemen, Naval Reserve officer trainees at the University of California seemed inclined to pull their punches in regular boxing set-tos. So their instructors thought up a game that looked something like a Donnybrook Fair but was actually the offspring of two respectable sports: basketball and boxing. By last week UCLA. trainers were delighted with the result. As they had hoped, the new game discouraged gentlemanly reticence; baskets and ball merely offered an incentive to slug the other man before he could get in his jaw-jarring lick. Best of all, it was giving trainees a practical demonstration of an ancient U.S. Navy tenet: the best defense is a strong offense. So, to re-cap: They were officer trainees. Their trainers wanted them to really rip into each other during their occasional boxing matches. But they wouldn't. So the trainers threw a basketball into the mix. Problem solved. Thank you, military mind!